Napa is a small town located at the base of California’s famed Napa Valley, a Mediterranean-like wine-growing region extending 30 miles northwest. Once agricultural in form and purpose, Napa has become a commercial and residential center. It also houses some commuters heading south into the San Francisco Bay Area. The town itself is unremarkable, and fortunately, growth controls have preserved its modest size. The wine-growing areas are beautiful, and the fortunate arrangement of mountains and the Bay have created one of the most appealing micro-climates in the world. The wine growing region is not only prosperous and acclaimed worldwide, but the wineries themselves create quite a tourist attraction. The area is close enough to the bustling Bay Area to pick up an influx of weekend tourists; the main roads and amenities can become quite crowded at times. But tight growth controls throughout the valley have preserved much of the agricultural look and feel, and the climate and physical beauty make the valley a special spot. As a result, home prices have gone through the roof; the area has some of the nation’s most expensive housing for a small city. The median home price of over $500,000 buys a tiny 2 or 3 bedroom bungalow or a small ranch – if you can find one. But the area is very nice for those who can afford it. Napa Valley is a deep, flat, fertile valley surrounded by wooded Coastal Range mountains rising to 1500 feet above the valley floor. South of Napa the valley turns into marshland. The northwest-southeast alignment of the mountains protects the area from wind and strong storms from the Pacific and from colder inland air in winter. The climate is Mediterranean marine, governed by the San Francisco Bay. Summer days are pleasantly warm and almost completely dry; evenings are cool with occasional incursions of low stratus clouds. Winters are cool and cloudy, with daytime highs in the 50’s and 60’s and only occasional readings below freezing. Most precipitation falls in winter as light to moderate rain, although some periods of persistent rain can cause flooding in Napa River. 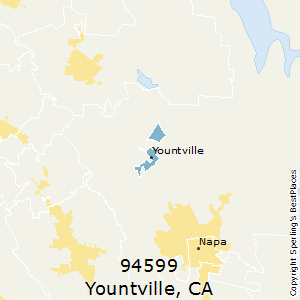 The median home price in Yountville is $899,100. Browse Homes in this Range. 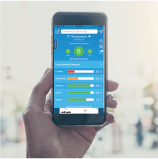 Compare Yountville (zip 94599), California to any other place in the USA.